This pontoon boat is for the entertainer with a built in 4 burner gas BBQ to port with bench space, two large ice boxes fitted to either side, 4 access gates port, starboard, bow with large ladder and to stern with a swim platform between the twin outboards. There is enough space to set out a full sized outdoor setting or maybe a pair of lounges. All this surrounds the large centre console driving position with its two person padded helm seat. Built like the Titanic the pontoons are 5mm plate aluminium with continuous folds in all underwater areas, that means there are no welded joins below the waterline and these pontoons are up to twice the thickness of some factory built pontoon boats. The top deck is a combination of heavy duty aluminium frame work and timber decking with the rear awning being made of a rigid aluminium frame and hardtop. The pontoons have 4 sealed bulkheads some being used for the purposes of fuel tanks, water tanks or sullage tanks. Access is available through top mounted soft patches between the pontoons and the deck of the boat. Fitted to starboard is a custom toilet / change room / storage recess with a full sized house hold toilet fitted, not a small boat style toilet. Something with some comfort for those long days cruising the Estuary or Swan River ! Powered by a pair of Yamaha 25 Hp High Thrust outboard purposely designed by Yamaha for this application with higher than normal push/pull requirements. They will offer you years of hassle free use. Upgraded to include digital gauges not otherwise included in this model of motor. Are you considering selling a similar boat we cater to owners from Busselton to Mindarie and everywhere in between. List your boat with the most progressive brokerage company in WA, we SELL boats and offer a NO SALE NO FEE listing structure. Call the team today and see why our clients are talking so highly of the R Marine Mandurah sales team ! R Marine Mandurah, "Experience the Difference". Sell Your boat with us NOW! 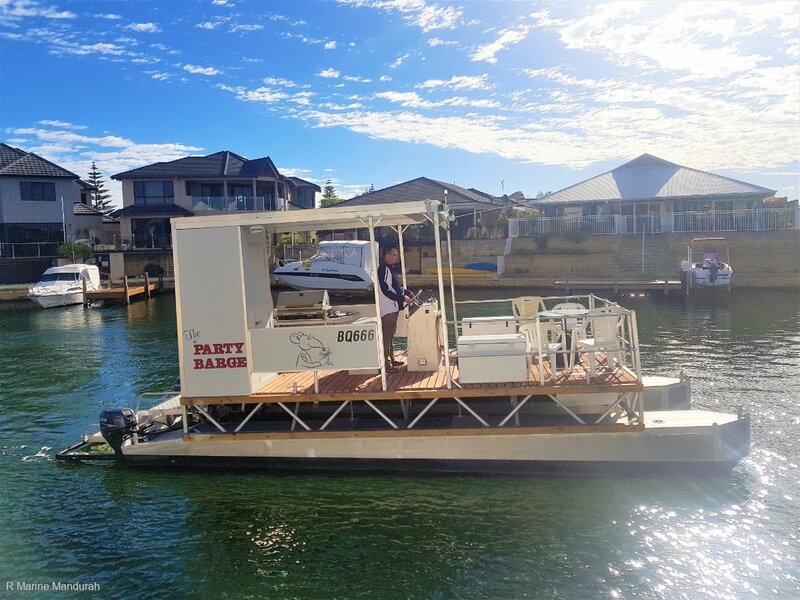 This is a uniquely built pontoon boat, built tough for the Mandurah region. There is hours of family fun awaiting here for the whole family. You can basically step on and go. R Marine Mandurah WA owned and operated. Come and experience the R Marine Mandurah difference for yourself. For Sales Service and Spares from Mandurah to Mindarie. DISCLAIMER: While all care is taken in preparing and providing this information we cannot guarantee or warrant the accuracy of this information nor warrant the condition of the vessel. Specifications are provided for information only and particulars herein obtained from sources believed to be correct. We accept NO responsibility regarding its accuracy, prospective purchases will need to undertake a full inspections, visually themselves and /or engage suitably qualified professionals to do so.